Hours: Mon-Sat 7:00 a.m. to 8:00 p.m.
Hey Joe, Where You Goin’ with that Bun in Your Hand? Barbecue pilgrims who come to pay their respects in the Land of Abundant Pork (aka Lexington) tend to favor the BBQ Center and Lexington #1. However, locals know that the nearly 40-year old Smokey Joe’s is the real deal too. There is no doubt that Joe’s serves up ‘cue that is worth a visit whether you are a Lexingtonian or a barbetourist. Smokey Joe’s inhabits a tidy, mid-sized brick building with green corrugated metal accents that sits six long, dull blocks from quaint uptown Lexington. Although modest, Joe’s nice building stands out on a commercial corridor that includes a bevy of light industrial uses, check cashing joints, discount stores, pawn shops and the like. This type of drab location, of course, is common for barbecue joints. (In fact, I am usually wary of barbecue joints located in the heart of downtowns–where downtown is there space for a joint’s pit, for one thing?) But who cares about location and building design when there is barbecue on the menu. If the meat is good, even windows are a needless luxury. In a town full of good barbecue, Smokey Joe’s manages to stand out. 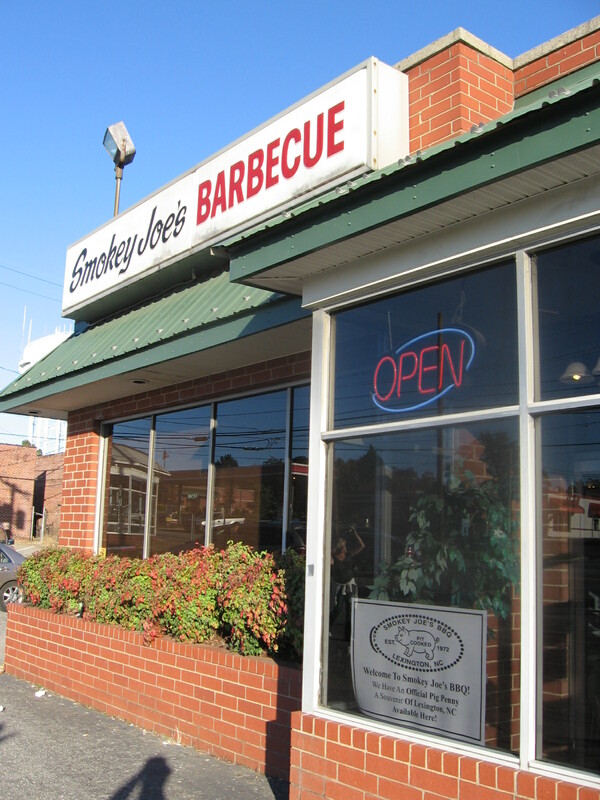 Smokey Joe’s may not be the best BBQ joint in town–of the places I’ve sampled, I’m still partial to Lexington #1, Smiley’s and Cook’s–but it’s darn good and worth a visit. Smokey Joe’s pork is tender and has a good deal of smoky overtones (or undertones, if you prefer), as you’d expect from a place with smoke in the name. If I was being picky I’d say the meat was ever so slightly on the dry side, but it’s sauced well and extra dip is readily available. Joe’s dip is a classic Lexington dip, which is to say it is a bit ketchupy for my taste but that’s the style they like in Lexington and it is is a good exemplar of the style. As an aside, it may be Lexington #1’s distinctive, non-ketchupy dip that causes me to rate it at the top of the pack of Lexington joints. Joe’s mayo-free barbecue slaw also sticks closely to the Lexington tradition, with fine chopped cabbage coated in dip. The slaw is both crisp and squeaky (you’ll know what I mean if you’ve ever had barbecue slaw) as you chew it. The hush puppies were a bit on the dry side, not fried as perfectly as they should be but passable. I ended my meal on a down note, as I sampled some of my dining companion’s side vegetables and found them lacking in flavor and freshness (instant mashed potatoes, it seemed, for instance). Back to the positive: Smokey Joe’s still cooks its pork in traditional, wood-burning pits, which is increasingly rare even in Lexington. As I’ve said before, this is a critical point for me, though I know others are not as fundamentalist about the issue (these others are, of course, uniformly ill-informed and not to be trusted). Smokey Joe’s is an official sponsor of the Barbecue Festival held in uptown each October, and its walls are decorated with plenty of vintage festival posters, a nice touch. Similarly, a couple of decorative “pigs on parade” from past festivals greet visitors at the joint’s entrance. 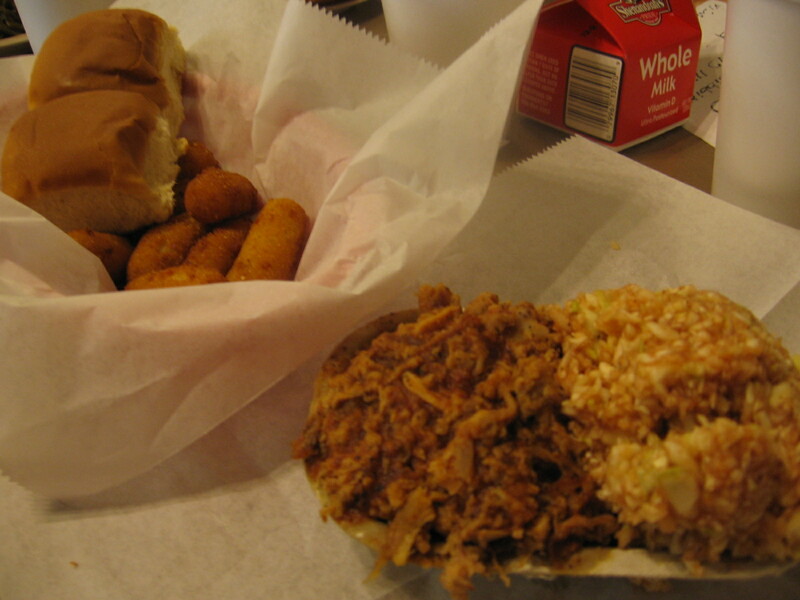 From the decor to the meal itself, Smokey Joe’s is a classic Carolina ‘cue joint and worth your patronage.